Handing the Western Wall to the Judaizers. Quick, if you’re a settler-dominated government uninterested in sharing Jerusalem with the Palestinian people, what’s a good way to telegraph your position without raising a ruckus? Well, one good way would be to turn over a sizable portion of Judaism’s holiest site to the management of a maximalist settler group — which is precisely what Israel’s government is about to do. …Elad is best known, perhaps, for its management of the City of David (Ir David) archeological excavations, which it has turned into a right-wing propaganda center, eliding Palestinian history in the city, ignoring findings that don’t support a Jewish-only narrative, and in the process of expanding its work, damaging (or simply claiming) the property of Palestinians living in the surrounding neighborhood, Silwan. Elad is also known for its aggressive efforts to settle — or, in its own words, to Judaize — Silwan, a Palestinian village that got tacked on to the modern municipality of Jerusalem after the Six Day War in 1967, part of a massive annexation that engulfed 64 square kilometers of Palestinian lands and more than tripling Jerusalem in size. This appeared last week in The Forward — to read more, please click here. Hatred at the Western Wall – not baseless. Note: The following appeared in Open Zion last Friday. According to the Hebrew calendar, we’re now in the month of Av, and fast approaching the single most grief-stricken day of the Jewish year. Tisha b’Av (the ninth of Av) begins on Monday next week, the day on which we mourn the destruction of our Temple (twice), as well as a series of other blood-soaked and heartbreaking events which, according to tradition (and in some cases recorded history), all happened on that single, terrible day. We’re taught that the Temple was destroyed (and by extension, Jewish history turned tragic) because of our own ungodly behavior—because of sinat chinam, baseless hatred. This came to mind for me as I watched the reports out of Jerusalem this week regarding the monthly prayer service conducted by Women of the Wall at the Western Wall. There they stood, these brave women and their male allies, facing the wrath, the spit, the thrown eggs and tossed chairs of Israel’s ultra-Orthodox community, right there, at the Kotel, on the very remains of our Temple, the very spot where hatred undid us. It’s easy for a Jew like me—an egalitarian-minded, Conservative-affiliated, American-Israeli Jew—to see the pictures and read the stories and immediately think: They’re doing what undid us. Those men in their beards and 16th century clothes, those young women bused in from religious institutions all over Israel, those people wielding projectiles and venom—they’re doing that which pulled us apart and scattered us to the nations. How can they not see? How, mere days before Tisha b’Av, can world Jewry not see what they’re doing? But though I am a woman of faith, I attempt to live that faith in the world as it actually is, not as I would like it to be, and the simple truth is: Those people don’t believe that they’re practicing sinat chinam. They believe, and I’m guessing with all their hearts, that they’re protecting the faith of our fathers from one such as me. That their hatred is not only not-baseless, it is righteous. “Nazism, Amalekitism, and Reform,” they screamed at their fellow Jews—which is to say: The men in the 16th century garb, the school girls, and whoever stood with them believe that women wearing prayer shawls are like Nazis. Like Amalek, the Biblical evil-doer whose name we are enjoined to “blot out.” And just to complete the picture, they rounded their insult off with the word “Reform”—in their eyes, Reform/non-Orthodox Jews are no better than Nazis. No better than Amalek. The simple and oft-denied truth is that Jews have not been a unified people since that unfortunate incident with the Golden Calf. We’re not a unified people, because no people is. That’s why religions have reforms and upheavals and breakaways—indeed, that’s why the Talmud looks the way it does. Because people have wildly divergent thoughts about the same ideas. And that’s also why, in a democracy, we’re not supposed to give one form of religious observance preference over the others—the very thing that Israel has enshrined in law, the very thing that allows ultra-Orthodox protestors to behave so vilely toward women who have come to our most sacred site in order to worship the Holy One. I don’t hate the people who equate Jews like me and Women of the Wall with Hitler. I don’t want to blot them out. I will not suggest that their Judaism is inauthentic. But I do not doubt that their hate for and fear of me is very, very real, and that their political power gives that hate and fear very real consequences. As a student of history, I believe that we lost our Temple because we were defeated militarily (this sort of thing happened a lot in Jerusalem, to all kinds of people); as a social scientist, I understand that the odium motivating this week’s protests has a good, solid base. There’s nothing we can do about either of those things, and none of my crunchy-granola angst about tikkun olam will change that. 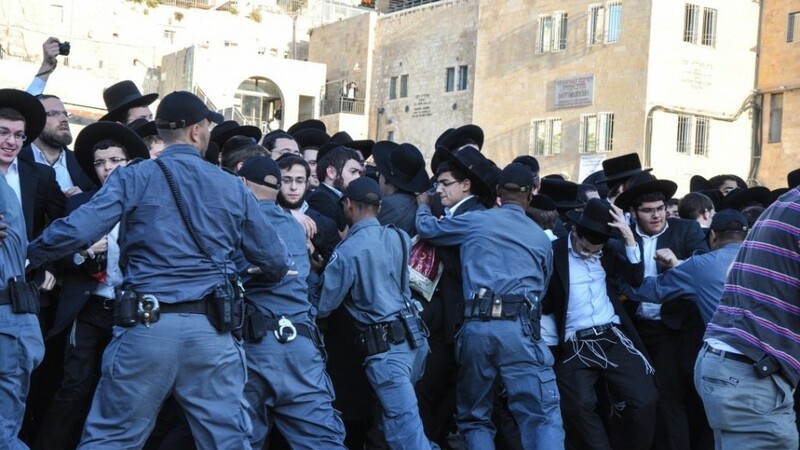 What other-than-ultra-Orthodox Jews need to do is precisely what Women of the Wall is doing: Claim our space. Take the state to court. Insist that there is no single way to be a Jew, and that no Jew can claim hegemony over that which is holy to us all. Even as I struggle within my own spiritual practice to learn the lessons of Tisha b’Av and expunge sinat chinam from my own heart, I don’t need the ultra-Orthodox to not-hate me. I need the state of Israel to protect my rights. 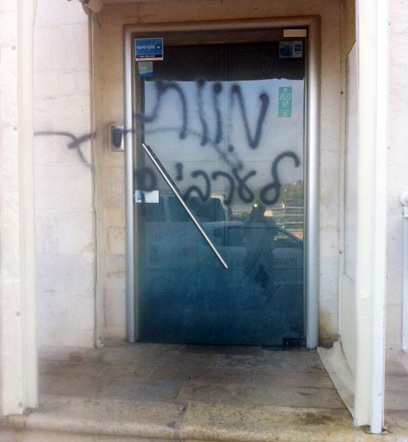 The Jerusalem District Court on Monday sentenced three Jewish minors to between one to eight months in prison after finding them guilty in a series of racially motivated attacks against Arabs last summer in the center of the city. Jamal Julani, then 17, a resident of East Jerusalem, was beaten the most severely. Defendant No. 1, who was 16 years old at the time, kicked Julani in the abdomen after he had fallen to the ground, said Zaban. … During the trial, it emerged that Julani has not fully recovered and is still under neurological and psychological care. The IDF… will hold its first hearing [on Tuesday] in the trial of Nariman Tamimi and Rana Hamadah, two Palestinian women who were arrested on Friday, June 28 at the weekly demonstration against the occupation in Nabi Saleh. …Hamadah told +972 that during her arrest she asked the IDF soldier why she was being handcuffed, to which he replied: “Because I feel like it.” Hamadah said the pair were left handcuffed and blindfolded for nine hours, and were driven around in a vehicle with two male soldiers for seven more hours before being booked in Sharon Prison. … Two military judges who watched video footage of the women’s arrest stated that they found no evidence of violent or menacing behavior on their part. It’s true that these reports discuss very different events, at very different stages of very different legal processes. The first describes the outcome of criminal proceedings in the wake of racist violence; the second, the early stages of the prosecution of nonviolent protestors under military law. But let’s play Swap The Nouns! What if the attackers in the first story had been Palestinian-Israelis, their victims Jews? What if the protesters in the second had been Jews, and the security forces Palestinian? What kind of sentences would Palestinian-Israelis receive in Jerusalem’s District Court, and how would the world respond to the Palestinian Authority picking up a couple of (female) Israeli protesters, abusing them, and putting them on trial for exercising their universal rights to assemble and protest? “It was the first time they didn’t beat us while we were arrested,” Nariman Tamimi later reported. As luck would have it, another incident has come to light in which we’ll be able to watch these disparities play out in real-time: Over the weekend, Jewish assailants targeted a Jerusalem restaurant for its practice of hiring Palestinian employees. When we tried to break the fight, but they attacked us too, and vowed to take revenge on us for hiring Arabs. … The restaurant’s employees said that police were called in at every incident but that each time officers arrived after the assailants had left the scene. Huh. I wonder what they’d call it if that same restaurant had been attacked by a handful of Palestinian guys. Who’s afraid of Palestinian puppet theater? Of course, I’m being unfair. The ability to silence puppets isn’t the only legacy of Oslo: Palestinians may now fly their flag without fear of arrest, and Israel has been able to use the Accords’ slow collapse to strengthen its hold on the West Bank (never mind that in so doing, Israel has been violating the Accords in deed and in spirit for two solid decades. Legacy!). And the Palestinian Authority is still around, serving as a convenient if toothless foil for all who want to complain about all that’s wrong in the post-Oslo world. Such as, apparently, puppets. Jerusalem Deputy Mayor Yosef “Pepe” Alalu also condemned it as “wrong and irresponsible” in a letter to Aharonovitch, noting the already heightened tensions between Jews and Arabs in the capital. However Alalu (once described by Haaretz as a “Hobbit-like man with the ponytail, beard and Spanish accent”) is affiliated with the left-wing, two-state-supporting Meretz, so I’m not sure that his protests—or indeed those of a handful of activists, a larger handful of puppeteers, or the world’s press—will make any difference to an Israeli right-wing that is only too happy to use Oslo not to build two states (as intended) but to prevent a Palestinian state from ever emerging. Deputy Mayor of Jerusalem David Hadari, of Naftali Bennett’s [hard-right] Jewish Home party, demanded that the city stop funding the Khan Theater because it is hosting a play about Rachel Corrie [the American activist killed by an Israeli bulldozer while protesting home demolitions in Gaza]. In the past few days I was shocked to learn that the Khan Theater is advertising a play which it intends to show about the tourist Rachel Corrie, who was run over in an unfortunate accident by an IDF bulldozer during an operation in Gaza. May I remind you, this was a girl who demonstrated against Israel, against IDF soldiers and against the IDF’s activities to protect the communities of the South from missiles and terrorists. In other words, this was an Israel hater who was unintentionally killed [note: the State Department isn’t so sure it agrees with this assertion] and that the courts in Israel refused the family’s requests for compensation… We should not lend a hand to problematic plays that hurt Israel and Jerusalem in the name of art. Unfortunately for Hadari, the Oslo Accords do not forbid the Jerusalem Municipality from funding freedom of expression, so we can’t know for sure that he’ll be able to protect his fellow Jerusalemites (including my own, poor, clearly benighted mother-in-law) from the horrors of a play that disagrees with the official narrative. But speaking as someone who literally danced in the streets of Tel Aviv on the night that the Accords were signed, I have to say: Twenty years down the road, watching the Israeli government use that agreement as a rag with which to do its dirty work while the American Secretary of State sweats and strains to get the sides back to the very starting point we thought we’d achieved in 1993—I’m not so sure that Rachel Corrie, or a bunch of puppets, are the problem. Painting a green line through Jerusalem. There is a green line that runs through the city of Jerusalem. It exists only on maps, and pretty much only on maps not printed by the State of Israel or other Jewish institutions, but it exists, and it represents a part of the international border between Israel and the West Bank as of June 4, 1967. It exists even though official Israel and its supporters have done everything within their not-inconsiderable power to erase it in word and deed, creating a municipal behemoth that is currently one hundred times larger than the city was a century ago, pushing Palestinians out of neighborhoods and family homes and rendering fundamentally unholy the very city towards which Jews pray three times a day. Today is June 5, of course, the anniversary of the opening salvos of the 1967 Six Day War in which Israel captured Jerusalem and the West Bank from the Jordanian army, the day to which many Israeli and Diaspora Jews look as the beginning of a miraculous liberation of our holy city—which is why a small group of Israeli and Diaspora activists chose this day to remind the world that no amount of governmental sleight-of-hand can change the fact that a border exists, and it runs through the very heart of a city that is endlessly declared Undivided. Anti-occupation collective All That’s Left brought out paint and brushes, got down on the ground, and painted a literal green line where it exists on maps and should exist in political reality. Presumably because they’re good citizens (in Hebrew parlance,yeladim tovim Yerushalayim), rather than paint directly on the ground, they painted on long pieces of cardboard, and as they painted, they engaged with onlookers. And of course, Israel has erased the international border, the Green Line, in many, many places, all up and down the West Bank, via settlement construction, Israeli-only roads, and the land-grabbing Security Barrier. 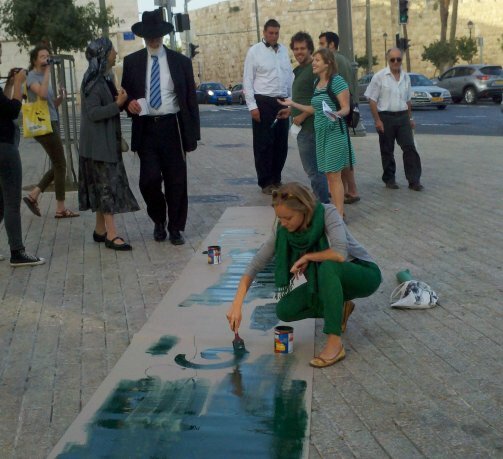 The simple act of brushing green paint down a Jerusalem sidewalk was intended, activists say, to call attention to the entirety of occupation—not just that in the nation’s capital—on the anniversary of its beginning. Yet it’s undeniable that the occupation is most easily denied in Jerusalem. Israeli and Diaspora Jews know what and where the West Bank is—they might support Israel’s settlement in that land, but they can’t fool themselves that it’s anything but a military occupation, at least for now. But the average Israeli long ago stopped thinking of Gilo, Pisgat Ze’ev, Ramat Eshkol, and French Hill as settlements. They’re just neighborhoods. Nice places to live, where the kids can run through the hilly yards behind sandstone apartment blocs. Reminding them, the Diaspora community, and the world at large that these neighborhoods (and many more like them) are every bit as illegal as the West Bank hilltop communities they see on the nightly news is an important, subversive act. Because if American and Israeli Jews are going to support the settlement project and all it entails—occupation, human rights violations, a possible end to the two-state dream—they need to be honest about it. They need to actually see what it means, especially in our holy city. Green paint and cardboard are a good place to start. 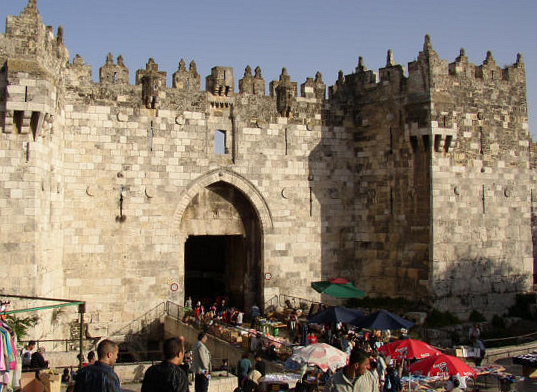 When We Say “Jerusalem,” What Do We Mean? Up and coming Israeli politician Yair Lapid has said time and again that he will never agree to “dividing Jerusalem” in any possible two-state peace with the Palestinian people; as I have detailed a time or two in these pages, this strikes me as delusional. But when Lapid or any other Israeli politician (or, for instance, American Jewish leaders like AIPAC executive director Howard Kohr) talk about Jerusalem (as Kohr very likely will at the upcoming AIPAC conference)—what are they talking about, exactly? It seems a simple enough question, especially to Jews who are active in the Jewish community and/or support Israel. Jerusalem is our holy city, the place to which we prayed to return three times a day for centuries, the only reasonable center for our national and spiritual aspirations. More than a collection of ancient streets and modern buildings, Jerusalem is central to our existence as a people. I’d venture that this is, in fact, what most Jews think when they hear the word “Jerusalem”—but the simple, and infrequently-stated, truth is that this vision is only part of the story. A fairly small part of the story, at that. The Holy City of Jerusalem is a very small place. It is, roughly speaking, coterminous with what is today called the Old City, and the holy part is even smaller than that: It’s the Temple Mount, upon which our Temple once stood. When we pray at the Western Wall, or face that direction from our synagogues and homes in Chicago, Johannesburg, or Sidney, we are spiritually attaching ourselves to the edge and memory of that Temple, to the holiness invested in it by our Scriptures and centuries upon centuries of our own prayers and longing. Of course, Jews have lived outside the Old City walls for a long time (at least since Moses Montefiore built his famous windmill in 1857 to coax them out of its then-fetid quarters), and by the time the modern state of Israel was established, there was a thriving “New City” of Jewish neighborhoods, roughly to the west of the Old City’s walls, an area that in 1948 covered about 15 square miles. 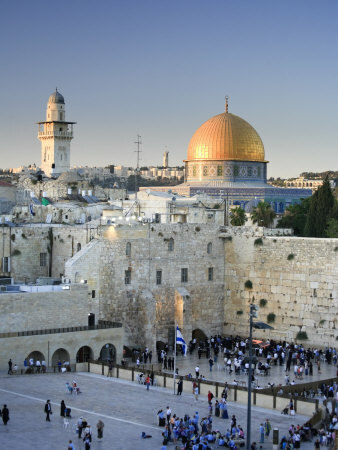 Today, the geographic location that is known as “Jerusalem” encompasses all of that—the Old City, the New City, East Jerusalem—and a whole lot more. Within days of the Israeli military triumphantly entering the Old City in June 1967, the government had annexed not only it, but also East Jerusalem and parts of the West Bank (including not just satellite villages, but parts of other cities) to create a new Municipality of Jerusalem. The total area annexed came to some 27 square miles. These annexed territories included not only the part of Jerusalem that had been under Jordanian rule, but also an additional 64 square kilometers, most of which had belonged to 28 villages in the West Bank, and part of which belonged to the municipalities of Bethlehem and Beit Jala. Following their annexation, the area of West Jerusalem tripled, and Jerusalem became the largest city in Israel. The annexation of land wasn’t just a formality: In the 1970s and 1980s, Israel expropriated much of the privately owned Palestinian land in the Jerusalem area for the sake of settlement neighborhoods such as Ramot, Gilo, and East Talpiyot, building Ramat Shlomo and Homat Shmuel (also known as Har Homa) in the 1990s, all of them beyond the Green Line in the West Bank but within what is now considered municipal Jerusalem. By 2008, the area governed by the Jerusalem Municipality came to a total of 48.3 square miles, nearly three times the area of all of Jerusalem—West, East, Old, and New—at the time of the Six Day War, and more than a hundred times larger than the city was a century ago. I am a woman of faith. I pray regularly, and when I do, I orient myself toward my Holy City. My faith, my Scriptures, the history and future of the Jewish people—I hold all of these in my heart when I come before my God, and when I teach my children the same. I have no question that we belong in Jerusalem. I have no question that the areas that were Jewish before June 1967 are rightfully Israeli, nor do I have any question that whatever the future may bring for Israel and Palestine, the sovereignty over Jerusalem’s Old City and the Temple Mount must be shared equally by the Jewish State. That singular place is, truly, the heart of our faith and our people. But the modern-day “Jerusalem,” the one to which Lapid and people like him refer, bears only a passing resemblance to the Holy City to which the Jewish people has long turned, and I would argue that the political machinations employed to systematically drive Palestinians from Jerusalem (holy and central to them, as well, after all) and deprive them of civil and often human rights while still within its borders render the entire city (however measured) significantly less holy. When people say they’re not willing “to divide” Jerusalem, that’s the Jerusalem they’re talking about: A bloated behemoth grown through municipal and national fiat, and maintained through laws and policies that are flatly discriminatory and often shade into xenophobia and racism. As it happens, the world’s Jews will be reading Parashat Ki Tissa this Shabbat, the Torah portion in which we learn of the folly of the Golden Calf. We will be reminded of the cost of raising something built with human hands above that which our faith demands, the cost of replacing real holiness with our own, poor vision. We will be reminded of the price of idolatry. When politicians and institutional leaders say that the Jerusalem of 2013 is a sacred, inviolable place, they are practicing a kind of idolatry—an idolatry that denies the legitimate rights of another people, and threatens the very possibility of ever achieving an end to war. There is absolutely nothing holy about that. 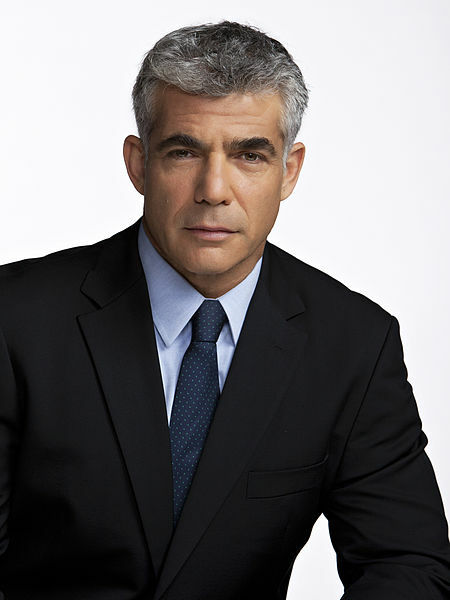 I don’t know what it is with Yair Lapid. Does he seriously just not read—anything? Ever? The other day, Lapid said the following. Out loud. With his mouth. Both parties understand that they have to go back to the Road Map. We have to jumpstart [the negotiating process]… People have to understand that we’re talking about the two-state solution. I think the Olmert administration went too far, and I think they made the mistake of starting with issues that should be postponed—like Jerusalem; like the right of return…. I’m against any kind of withdrawal from Jerusalem. Jerusalem is not only a place, it is also an idea. I mean, this is the founding ethos of this country, and countries do not give up parts of their ethos. Second international conference [to be] convened by Quartet, in consultation with the parties, at beginning of 2004 [writer’s note: ha!] to endorse agreement reached on an independent Palestinian state with provisional borders and formally to launch a process… leading to a final, permanent status resolution in 2005 [writer’s note: haha! ], including on borders, Jerusalem, refugees, settlements. …Parties reach final and comprehensive permanent status agreement that ends the Israel-Palestinian conflict in 2005 [writer’s note: sob], through a settlement negotiated between the parties based on UNSCR 242, 338, and 1397, that ends the occupation that began in 1967, and includes an agreed, just, fair, and realistic solution to the refugee issue, and a negotiated resolution on the status of Jerusalem that takes into account the political and religious concerns of both sides, and protects the religious interests of Jews, Christians, and Muslims worldwide, and fulfills the vision of two states, Israel and sovereign, independent, democratic and viable Palestine, living side-by-side in peace and security. I’ve written before about Yair Lapid’s shockingly willful ignorance on this issue, but as he doesn’t appear to be taking my calls, I’ll say it again: The Road Map, just like every near-solution of this eminently resolvable conflict, explicitly presumes a shared Jerusalem, because there is no way to a two-state solution without it. There is not now, nor has there ever been, anything holy (or ethical, if we’re going to talk about an “ethos”) about Har Homa, or Givat Zeev, or the wholesale takeover of Palestinian villages and farmland in the immediate wake of the 1967 Six Day War in which Israel’s government unilaterally expanded Jerusalem’s municipal boundaries ten-fold. There is nothing holy, ethical, or even wise about destroying the homes of Palestinian families, the much-ballyhooed E-1 construction, or denying a reality that is everywhere around you. I know that the thing we’re supposed to take from Lapid’s ill-advised talking with his mouth is that he slammed Ehud Olmert (who, by the way, was the last Israeli official to make any genuine effort toward peace), and sure: That takes some chutzpah. A dude who has zero experience with government or diplomacy slamming a politician whose entire career has involved one or both, a politician who has openly discussed the evolution he underwent as a result of his actual lived experience as Prime Minister of a country in a state of perpetual war. That’s something special, right there. If Yair Lapid doesn’t want to bother to read any books about the conflict in which he’s been living his entire life, maybe he could do us all a favor and at least read the documents to which he refers in his speeches. Then maybe we could start to deal with the actual Palestinians, rather than the imaginary ones Israel has been peddling all these years.